Rare conditions are diseases that affect only very small percentage of total population. Rare condition are usually caused by genetic, although those can be caused by burn injuries. 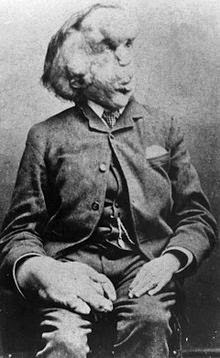 Born on 5 August 1862 in Leicester, England, Joseph Merrick came normally with no symptoms of having Proteus syndrome. At the age of almost 2 years, his lips began to swell, his skin began to loose, with a bony lump on his forehead. His bones in right arm, both legs, and skull started to deform as he grew into his adulthood. 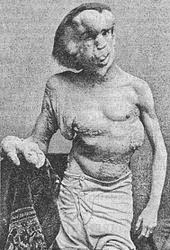 He lost his job as a cigarette roller and salesman due to his deformity to do those properly. He finally found a job as exhibition performer after being homeless and unemployed for more than four years. Merrick died on 11 April 1890 at London Hospital in London, England. Cause of death was asphyxia triggered by his dislocated neck after attempting to sleep laying down just like other people, one of his dream. Normally, he always had to sleep in sitting position due to overweight of his head. 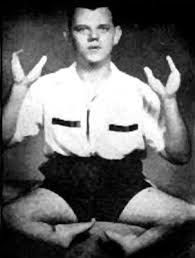 Grady Franklin Stiles was born on 26 June 1937, he was born with ectrodactyly syndrome, in which the all fingers, except the thumbs, fused together and form like claw-alike hand. 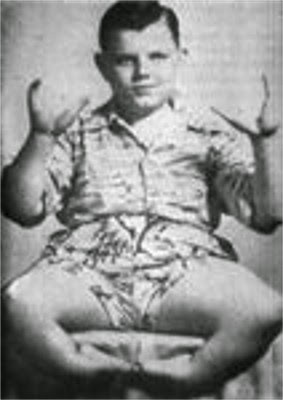 Stiles spent his life as a freakshow performer. He was unable to walk and using wheelchair or his strong hands to move. He died on 29 November 1992 after murdered by paid assassin hired by his wife and his stepson. The reason was because Stiles was alcoholic and too temperament as he ever killed his daughter's fiancé right in the wedding day, he was given probation instead of be sent to jail. There is a man with the same deformity named Black Scorpion from Austin, Texas, doing modern freakshow. Ella Harper was born in Hendersonville, Tennessee around 1870 and 1873. 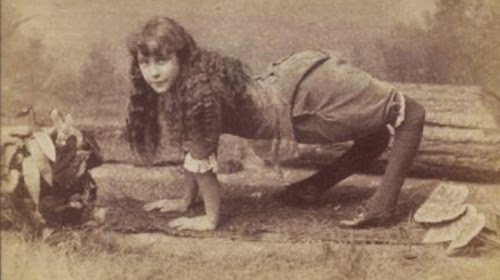 She was born with a very rare orthopedic condition called genu recurvatum that made her knees to bend backwards. She spent her life as a freakshow performer with $200 a week salary. I am called the camel girl because my knees turn backward. I can walk best on my hands and feet as you see me in the picture. I have traveled considerably in the show business for the past four years and now, this is 1886 and I intend to quit the show business and go to school and fit myself for another occupation. A remarkable little girl from Bangkok, Thailand, was born with hypertrichosis which makes her hair overgrowth. She has received several hair removal by laser but unable to stop her hair from growing back. 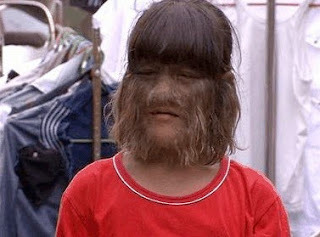 She received an award by Guinness World Records as the "Hairiest Girl in the World". She is happy with her condition that makes her famous, but she always dreams of getting her hair removed and to be a doctor. Dede Koswara from Bandung, Indonesia, was born with epidermodysplasia verruciformis which is a extremely rare genetic disorder. 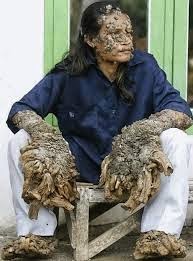 The disease grows thousands of wart all over his body. He lost his wife after his warts started growing, and also has lost and unable to find a new job. He lives isolated in his neighbour area. His life was documented many times by many tv programmes, including Discovery Channel and TLC. Until now, he has been undergoing a lot of surgeries in his life since 2007. No response yet to "People with Rare Conditions"